This is an old style bag for old style Chips. The logo is way too big - you can't really see the flavor title when the bag is full because of the natural curvature of a full bag of Chips. 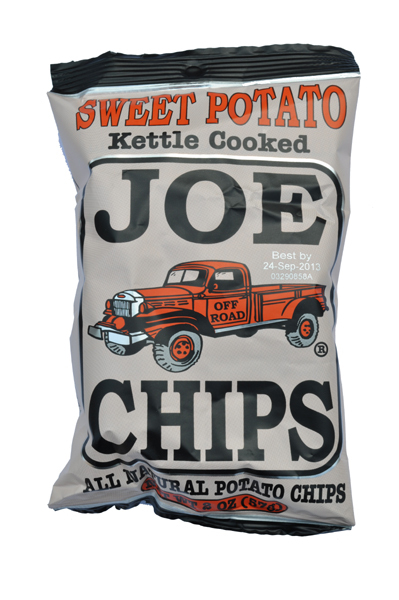 The flavors are color coded however, and the truck could become an iconic symbol for the Chips as it has for Joe Tea. These Chips looked so hard that it was rather surprising that they could be crunched through at all. What followed however, was a one crunch special. Or in other words, just a few bites and they quickly turned mushy. These Kettle Cooked Chips looked like leaves that had been painted a dark orange color and then left to dry. They were however thicker than leaves and the curling and bendiness of them made them look less like Potato Chips and more like something that might be good for you! Sweet Potato Chips are lower in sodium content and higher in sugar content than ordinary Potato Chips. The taste was an unfamiliar one. They did not taste like Potato Chips as such, they tasted of dessert - If it was made of Potato Chips! As for rating them, well, they absolutely tasted of Sweet Potato, which is of course an acquired taste. The fact that they were not our acquired taste is not relevant.